The MT1888 products are state-of-the-art Laser Source/Spot Simulators (LSS) used for the testing of laser guided munitions such as the Hellfire & Hellfire II missiles, Paveway, and the AGM-65E Laser Maverick missile. 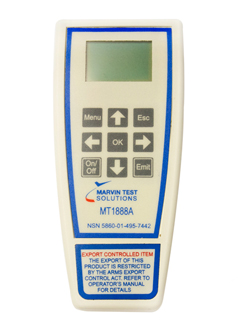 The MT1888 is field programmable and uses thumbwheel switches to select any PRF code. As a hand-held LSS, the MT1888 can be used in the field (O-level) or in the shop to exercise laser seekers, simulating the laser return of a lased target. The MT1888A is a state-of-the-art Advanced Laser Source / Spot Simulators (ALSS) used for the testing of laser guided munitions such as the Hellfire & Hellfire II missiles, Laser JDAM, Paveway, or any other laser-guided weapon. The unit is field programmable and uses an LCD and membrane switches to select any PRF or PIM laser code. As a hand-held ALSS, MT1888A can be used in the field (O-level) or in the shop to exercise laser seekers, simulating the laser return of a lased target. 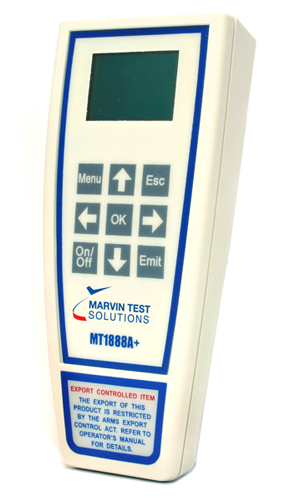 The MT1888A+ adds remote control operation to the MT1888A via an RS422 interface, allowing the ALSS to be controlled by a computer for automated test applications. 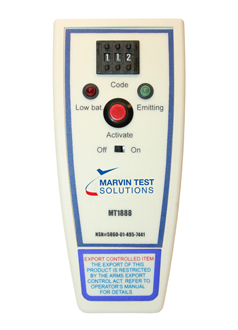 The MT1888A+ is supplied with an ATEasy driver, allowing all functions to be remote controlled. The hand-held MT1888 can simulate the return signature from a lased target. After selecting the laser code using the thumbwheel or membrane switches, the MT1888 is held in front of the laser-guided weapon and moved to simulate a moving target. 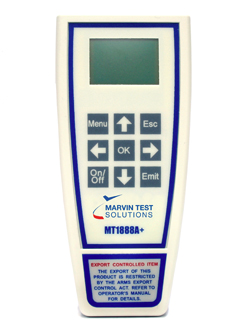 The MT1888A and MT1888A+ use an LCD and membrane switches, allowing the user to select any valid PRF or PIM code which will cause the ALSS to modulate the laser signature accordingly. The MT1888A utilizes a built-in keyword generator to create PIM codes. The user can enter any prescription to create other keywords. The newly programmed keywords cannot be saved and can be used until the power is turned off. The MT888A menu allows the selection of continuous emit mode that makes the presence of an operator unnecessary. The MT1888 emits extremely low power infrared light and can be used without protective (safety) goggles. A Built-in-Test circuit verifies the unit is functional and the EMITTING indicator blinks as long as infrared light is being emitted. A low-battery indicator announces when the standard 9 V battery needs to be replaced (battery power is below 30%). The MT1888 has been certified to operate with Hellfire and Hellfire II seekers. The unit can be ordered under National Stock Number (NSN) 5860-01-495-7441. The MT1888A has been certified to operate with Hellfire and Hellfire II seekers. The unit can be ordered under National Stock Number (NSN) 5860-01-495-7442.